The source, size, and number of firebrands. The distance the firebrand is carried downwind. The probability of igniting a new fire at the downwind location. Short-Range Spotting is not generally considered as significant in the growth of wildfires, because the advancing fire usually overruns the developing spot fire. Based on that, the assumption is that short-range spotting is typically accounted for in the spread model outputs. Long-Range Spotting is differentiated from short-range spotting, primarily because firebrands are being lofted by a convection column and carried beyond the immediate fire area. 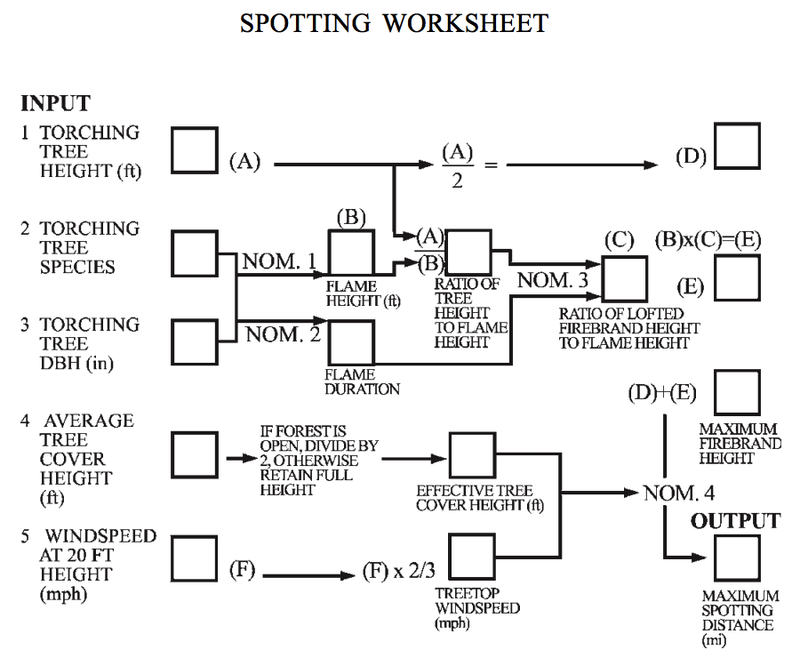 Both the included Spotting Distance Nomograms, shown here, and BehavePlus provide methods for estimating the Maximum Spotting Distance from a Torching Tree, or trees. 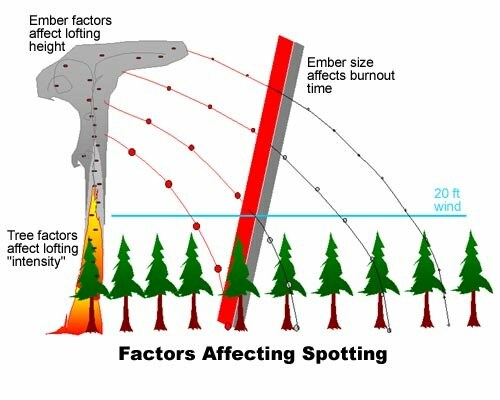 The maximum spotting distance model requires identification of tree species, height, and DBH (Diameter at Breast Height) of the torching tree to estimate the flame height and duration from the torching tree that will initiate the lofting of the ember into the windfield. Further, the open windspeed is used to suggest how far the firebrand will be transported as it falls back to the ground, and the nomogram because it assumes level ground uses the surface (20ft) windspeed and direction. The downwind Canopy, or Tree Cover, Height (reduced by half for open canopies) is used to factor out embers intercepted by the canopy before reaching surface fuels. The graphic here depicts additional inputs to the BehavePlus spotting module. In mountainous terrain, ridge top winds are used if wind is blowing across valleys as shown. The shape of the valley is considered with inputs for Ridge-to-Valley distance and elevation difference. This table assumes three torching trees 50 ft tall and 10-inch DBH with downwind cover and an open stand of 50 ft tall trees. This process and the nomograms that integrate the factors do not factor in terrain features as discussed above. Torching Tree: Species, Height, DBH. Downwind Average Tree Height (Divide by 2 for open stands). 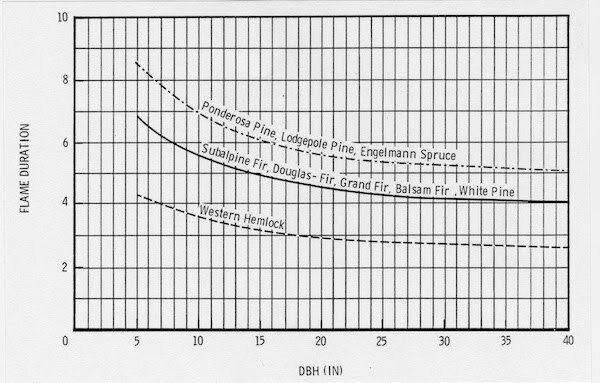 Start with input DBH, draw a vertical line to interest curve for input torching tree species, turn and draw a horizontal line to determine flame height in Nomogram 1 and flame duration in Nomogram 2. Divide Flame Height (Nom 1) by the input torching tree height and use that value to select the curve in Nom 3. Using the flame duration (Nom 2), draw a vertical line from the bottom axis to intersect the selected curve. From that intersection, draw a horizontal line to determine the ratio for calculating firebrand height. Multiply ratio from Nom 3 by flame height to determine firebrand height. Using the estimated firebrand height, draw a vertical line from the bottom axis on right to intersect curve for selected downwind tree height. From intersection draw a horizontal line to line for input windspeed, then down to spot distance. Follow 1 to 5, left to right on each line. 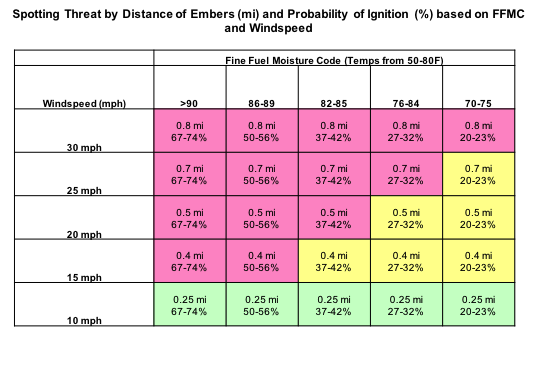 Though tables for Probability of Ignition are provided in the Fuel Moisture section, they describe only the likelihood that an ember will ignite a fire in receptive fuels. Wildland Fire Decision Support System (WFDSS) spatial analyses integrate the potential frequency and distance for spotting fire behavior, but frequency information is hard to isolate. FARSITE, FLAMMAP, and FSPro attempt to integrate the estimate of the number of embers and the distribution of distances they travel into the fire growth projection. Estimating maximum spotting distance from nomograms or BehavePlus only suggests an outer perimeter for spotting potential. A suggested method for applying the WFDSS spotting models is to isolate the potential probability of spotting across significant barriers using FSPro analysis. FSPro is normally used to apply probabilities associated with windspeed and direction combined with day to day variability in fuel moisture scenarios. The MTT spotting spread model includes monte carlo probability assessments associated with embers lofted from crown fires. Assume a one-day analysis with forecasted ERC, Windspeed and direction favorable to spotting spread. Assume a number of fires (several hundred to several thousand) using the one-day scenario from above. Ember source location from user applied probabilities. Ember size and, therefore, distance. Probability contours produced by the analysis reflect the locations for possible spotting and the relative probabilities for their occurrence. Tonja Opperman demonstrated this technique on the Chakina fire near McCarthy, Alaska in 2010. Output map is shown here. Tonja Opperman, Fire Applications Specialist, Wildland Fire Management RD&A, assembled these tables based on contributions and discussions among many fire behavior researchers, programmers, and practitioners, including: Pat Andrews, Mark Finney, and Chuck McHugh at the Missoula Fire Lab; Brian Sorbel from the Alaska Region of the NPS; Mitch Burgard and Erin Noonan-Wright from the Wildland Fire Management RD&A; Stu Brittain with Systems for Environmental Management in Missoula; Joe Scott with Pyrologix in Missoula; and Rick Stratton from the Pacific Northwest Region of the USFS. Corrections can be forwarded to Tonja Opperman at tonja_opperman@firenet.gov. Nomograms published in Rothermel (1983) are based on the model published by Albini (1979). Predictive mathematical model to calculate the maximum distance an ember will travel from a single firebrand is lofted from a torching tree to calculate maximum distance. Spotting from torching trees is based on nomograms with options for multiple torching trees and terrain adjustment (Albini 1979, Chase 1981, Rothermel 1983). BehavePlus also calculates spotting from wind-driven surface fire (Albini 1983, Chase 1984, Morris 1987) and spotting from burning piles (Albini 1981). 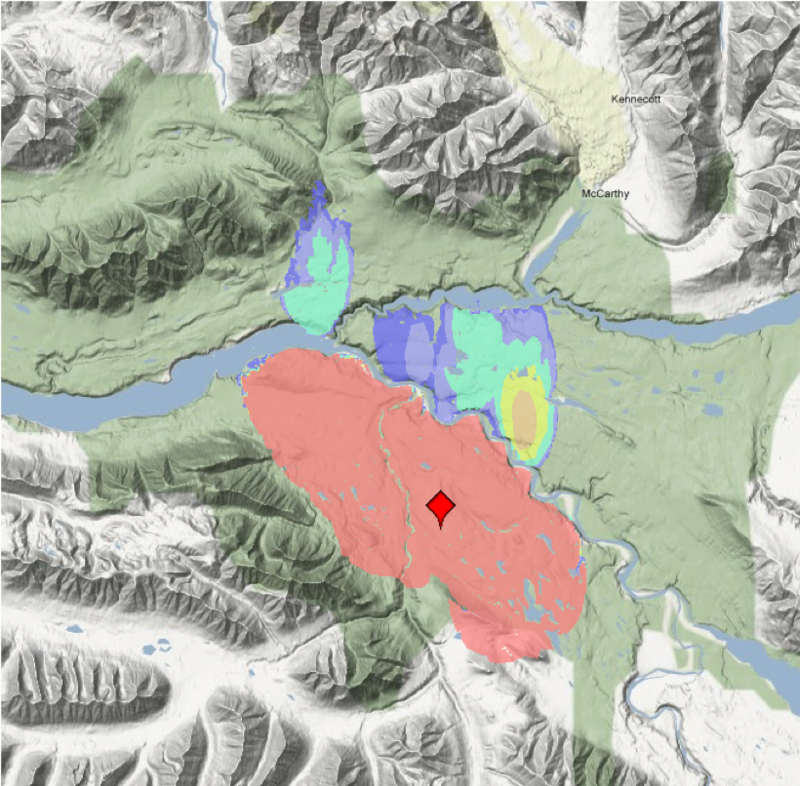 Spotting from active crown fire will be added in BehavePlus v6.0 (Albini et al. 2012). 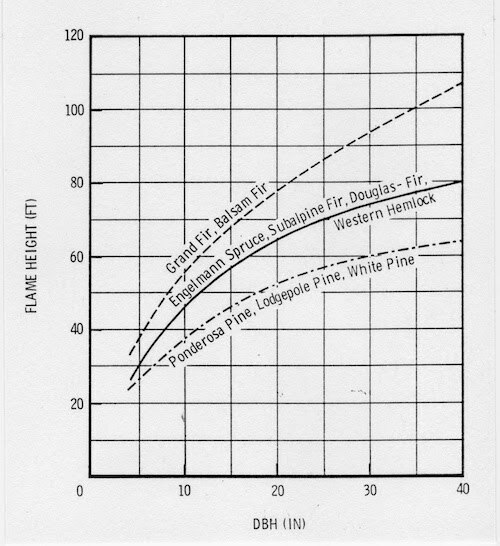 Maximum spotting distance from a single torching tree on flat ground is read from a nomogram. Maximum spotting distance from torching trees (single or multiple) is displayed in a table and graph. Probability of ignition is calculated separately. Assumes level terrain; single torching tree. Does not account for likelihood of trees torching, firebrand material availability, the number of spot fires, or the probability of ignition for that firebrand. Accounts for terrain and number of torching trees. Number of torching trees is used to calculate firebrand lofting height; higher firebrands travel further, all else equal. Does not account for likelihood of trees torching, firebrand material availability, or the number of spot fires, or the probability of ignition for that firebrand. In all geospatial systems, embers are only generated from passive and active crown fires, not from surface fires, fire whirls, burning piles, or structures. Spotting can be turned off or set to zero in all tools. Canopy characteristics from spatial layers (LCP). Analyst specifies foliar moisture content. Spotting tree species is always grand fir with a DBH of 20 cm (7.9 inches). Analyst sets spotting probability. Can be higher than allowed for NTFB, generally less than 0.25. Wind speed/direction is constant for entire burn period, but can use gridded winds that are modified based on topography. Weather is static, though dead fuel moistures can be conditioned. Spotting tree species is always grand fir with DBH of 20 cm. Analyst sets spotting probability. Maximum setting needs to be less than 0.15. Distance and perimeter resolutions are determined from the LCP resolution; timestep is 60 minutes. Wind speed/direction input can be changed hourly. Forecast wind speed and direction are for every 3 hours. Gridded winds are not yet available. Canopy characteristics are from spatial layers (LCP). Foliar moisture content always 100%. Spotting tree species is always grand fir with a DBH of 20 cm. User sets spotting probability for each fire danger (ERC) bin. See STFB. Winds can be probabilistic, forecast or a combination. Weather can be probabilistic or forecast or combination. No fuel moisture conditioning. Fire behavior is calculated for each cell. Nodes are on fixed grid equal to LCP spatial resolution. User-set spotting probability determines which predicted crown fire cells (and associated nodes) can produce spots. Those nodes generate a single ember with random distance from zero to the max for that node. For cells predicted to have active or passive crown, 16 incrementally-sized embers are lofted. Max ember distance & azimuth are calculated using canopy cover, crown fraction burned, elevation, and all available wind information. Embers landing on unburnable or already burned substrate do not ignite. Embers landing on burnable substrate always ignite (Finney 2002). Similar to spotting in FlamMap 5.0 and FSPro. Vertices loft 16 incrementally sized embers. The number of vertices depends on perimeter and distance resolutions & timestep. Each ember goes through a random draw process based on user-set spotting probability. 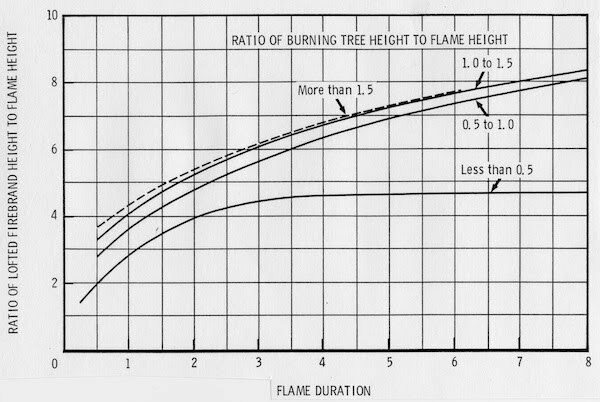 Ember distances and azimuth are based on canopy cover, crown fraction burned, elevation, winds, and species/DBH. Embers are tracked until they burn out or land. Ignores all embers that land within one cell from where the ember originated, as the main fire would eventually burn over these spot fires. A spotting grid overlaid onto the LCP allows the first spot that lands in a burnable fuel model to “seize” that cell so no other spots can land in that particular cell. Models fire behavior for every cell simultaneously for a single scenario, and uses MTT to calculate fastest fire travel paths. Embers produced only with passive and active crown fire. Randomly lofts a single ember from a node if the predicted fire type is passive or active crown fire. Simulates lofting and downwind travel of individual embers of different sizes from each vertex that exhibits passive or active crown fire. Fire probability surface output that may or may not distinguish spot fire activity. Spotting only occurs when passive or active crown fire is modeled. Finney and Scott & Reinhardt methods are available for crown fire; each calculates crown fraction burned (CFB) differently. 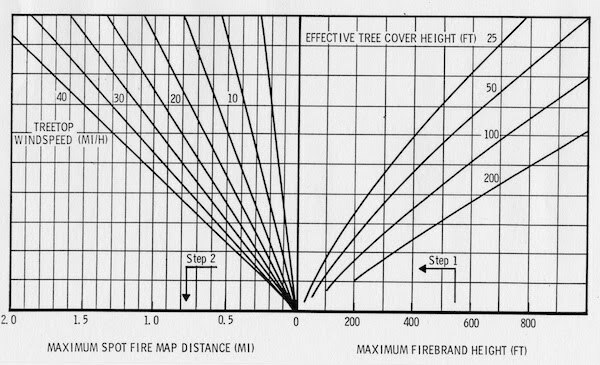 CFB and canopy cover are used to determine “number of torching trees” (1-10) used in firebrand lofting height. More embers will be lofted at finer landscape resolutions. Faster ROS will encounter more nodes, but the absolute number of nodes is static. One ember per node; less chance than in NTFB/FARSITE that an ember will travel the maximum distance. NOTE: Users will probably want to set spotting probability higher in STFB than for NTFB tools. Grand fir is used as the spotting tree species for the entire landscape. Distance resolution, perimeter resolution, and timestep are automated. The minimum spotting distance (set to the landscape resolution) essentially skips the first cell. For example, on a 60-meter landscape, no spots occur in the first 60 meters from the perimeter, but any viable embers that land beyond 60 meters can produce spot fires. NOTE: Users will probably want to set spotting probability lower in NTFB than in systems using MTT (STFB, FSPro). Same as STFB. Finney and Scott & Reinhardt crown fire methods are available; each calculates crown fraction burned (CFB) differently. CFB and canopy cover are used to determine the number of torching trees used in firebrand lofting height. NOTE: Users will probably want to set spotting probability higher in FSPro than for NTFB tools. Calibrate FSPro with STFB utilizes consistent spotting methods.